So, I leaned on an adjacent wall. Then I realized that the always firm land was actually moving violently. In fact, it was shaking and roaring. In front, a wall started coming down. If I had walked on the other side of the road, I would have been hit. I sat down on the pavement. My mind was telling me to find a safe open place. But running was impossible with the earth rolling. As I slowly balanced myself, two young girls called, ‘Aunty come here, come here’. I walked towards them, but I needed physical support. The girls grabbed each of my arms. I started chanting, my voice thin and nervous, while the girls just cried. A few cars stopped, with drivers looking for flat tires. Tense faces, watching and waiting! And the land in full swing, the walls shaking, the electric pole swinging, the earth roaring! Never in my life have I gone through such a long 55 seconds!! I was in tears. I went home to check on my parents, confirmed they were fine. I went to my friend’s place as I thought there is nothing to worry about because an earthquake generally is followed by one aftershock and all is back to normal after that. As I walked past the neighborhood, I saw that every alternate house had a collapsed boundary wall. I helped clear a fallen wall on the main road. As I reached the friend’s house, the aftershocks (26mins later) began. Gr ra ra raa, the earth was rumbling, the wave moving. It went on for an hour. 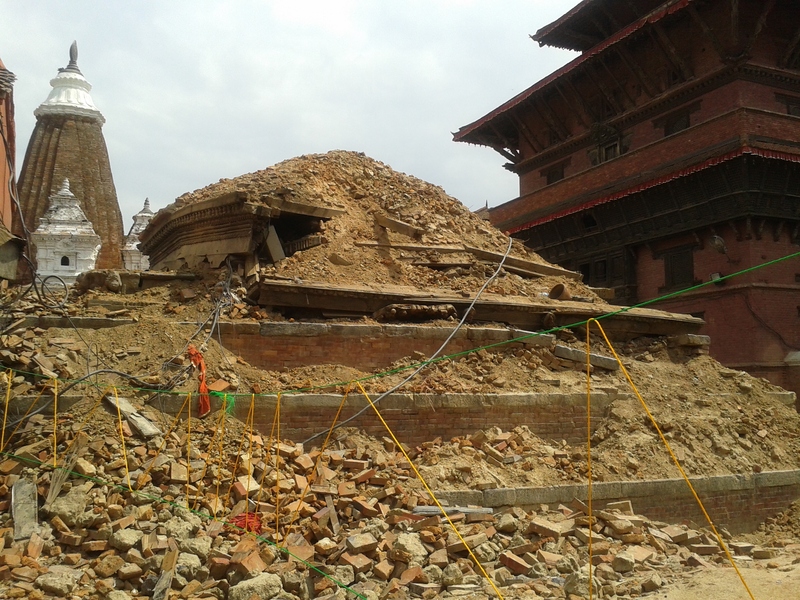 As we called friends and family, messages came in…Dharahara, the tower gone, all three Durbar Sqaures badly damaged, Sankhu, the village flattened, the death toll increasing! On that day, we had 39 aftershocks, many above 5 on the Richter scale. The next day, my temple decided to feed hundreds of people who had left Patan City. We also fed the injured in a nearby hospital. Then, another big aftershock (6.5 Richter). 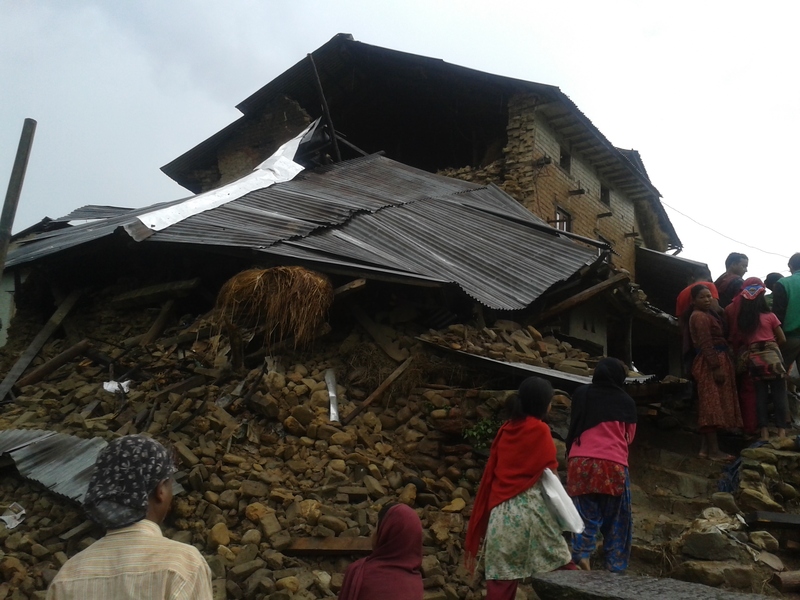 Two days, 69 aftershocks — the 25th and 26th April were like living in a horror movie!! Day three took me to a nearby village. We had to walk past a land slide and the scene we encountered of collapsed homes was no different from what one sees in many villages in hard hit districts. Two weeks of this trauma and a very slow recovery. 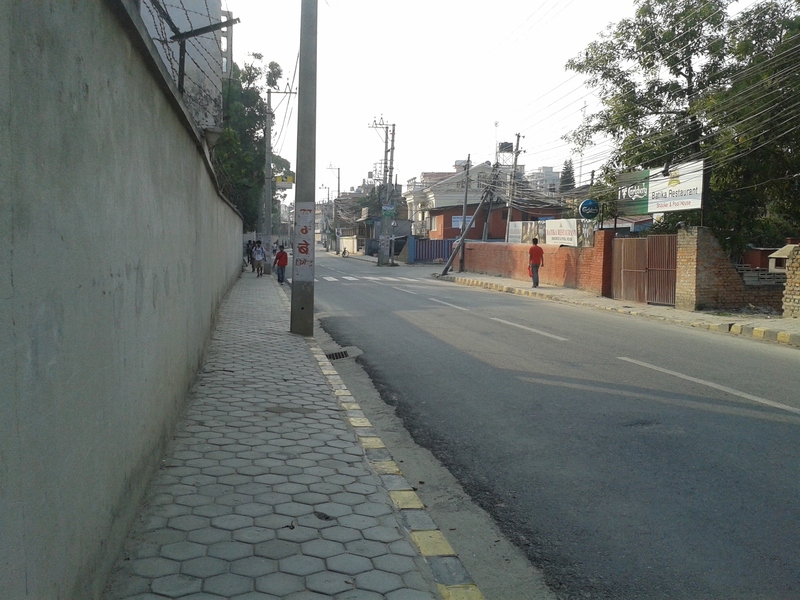 But, we were jolted again by a huge quake on 12th May (7.3 Richter scale). We don’t even feel the many real aftershocks anymore, but we can feel our own aftershocks! Our body shakes even without a quake!! When a group of dogs start barking, you think – is a quake coming? When birds fly in a group and squeal, your first thought is – another shake? We sleep fully dressed; some even wear shoes to bed. People have helmets at home, while others keep digging tools nearby. Shower time is the worst as your mind asks what if an earthquake comes now. We never built earthquake resistant houses, so structures have become weak from the continuous shaking. I feel sick and dizzy all the time…and it is not just me. The reminders are everywhere. 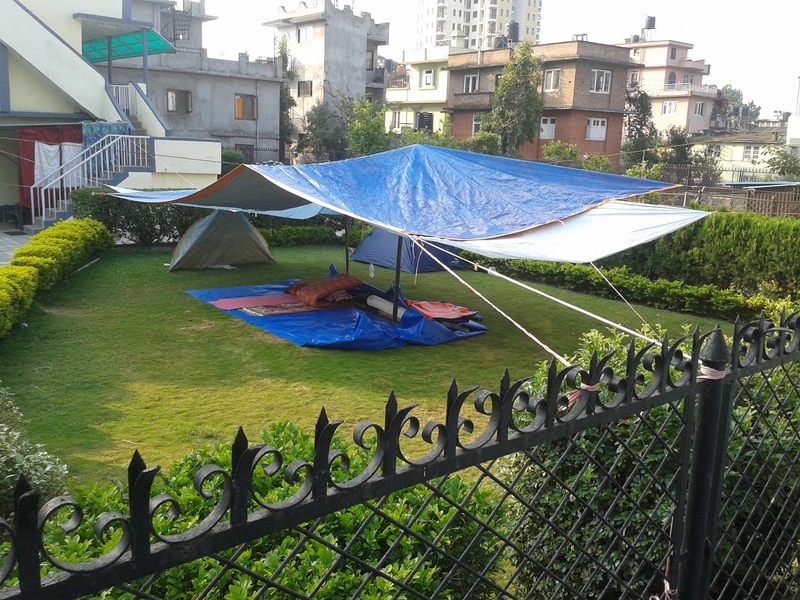 Life in tents…..even after three weeks! Amidst this horror, the youth have just poured out to villages to help the needy. But, the challenges are huge! Providing relief to one village of 20 families might take 10hrs of walking. There are villages that haven’t still been reached. Dead bodies of domesticated animals are all around. Villages are filled with children, women and the old, as the able-bodied are away for work. On a positive note, SANDEE’s support was great! The immediate concern from SANDEEites was overwhelming and made me realize that being a part of SANDEE is worth hundreds of other achievements! I got calls and emails from researchers, with some calling every evening. Some asked if they need to come down to Kathmandu to help, while others told me to move my family to their country for the time being. Someone even offered to pick up the cost of my travel and stay. We really have created a family. The love, support and concern shown by SANDEEites was a very fulfilling. The impact of this disaster is mind-boggling — even the most developed country would not be able to handle this. Here is a link to the collapsed Godavari Resort , where SANDEE held many workshops: Out of 75 districts in Nepal just 14 districts were hit, but the magnitude of the loss is around two times the country’s annual budget. Villages have been wiped out and 90% of houses flattened in many districts. The houses were built by migrant workers, who sweated their body and heart out in the Middle East — 55 seconds and they are worse off than when they started!! The loss of infrastructure is huge — roads, hospitals and government offices are gone. Of the 4000 schools in the 14 affected districts, nearly 600 are totally collapsed, 3000 more are either partly damaged or are not usable. What do we do? Where to start?